After four recent close losses, the bottom fell out Wednesday night. 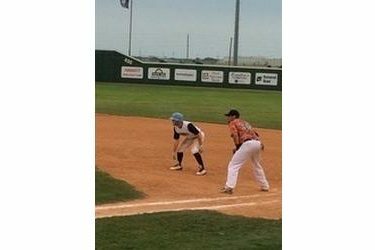 The El Dorado Broncos move 1.5 game ahead of the Liberal Bee Jays in the Jayhawk League North with a 9-1 win over the BJ’s at Brent Gould Field. El Dorado plated four in the second powered by a three run home run from Clayton Dalrymple against starter Matt Hape. The Broncos scored again in the fourth before plating two in the fifth. Liberal’s only run came via Nick Brooks’ prodigious home run to left for his fourth of the season. Hape pitched two innings before Trenton Rousseau pitched four innings and Lee Busto pitched two scoreless innings in relief. Liberal has lost five of their last six and falls to 21-13 overall and 17-11 in the Jayhawk League while El Dorado is 21-9 and 18-9 in the league. The same two teams play Thursday night at 7 with a 6:45 Dugout Show on 1270 and kscbnews.net. Electric Motor Service is the buyout sponsor.